Ukrainian troops defeated a strong attack of separatist forces in Avdiyivka Over the past 24 hours the Donbas militants 70 times opened fire the Ukrainian troops, according to the headquarters of ATO. The hot spots included Avdiyivka, Luhanske, Pisky, Opytne, Nevelska, Verhnyotoretske, Artemove, Kamyanka, Svitlodarsk and Bohuslavske at Donetsk direction, Novotroitske on Mariupol direction, and Trekhizbenka and Stanytsya Luhanska on Luhansk direction. 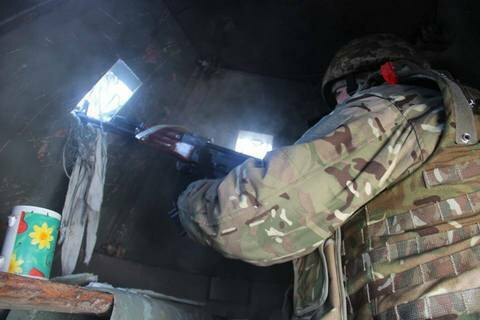 The ATO troops 19 times opened backfire from small caliber weapons. Ukrainian soldiers and volunteers report in social media about a powerful attack of militants in the industrial outside Avdiyivka. The combat started on Thursday evening and ended ended around midnight. Three Ukrainian soldiers are reportedly wounded, including one heavily. Enemy's losses are significantly larger. One enemy tank shot down. The clashes around the industrial zone of Avdiyivka intensified in early March, when ATO took control over the Donetsk – Horlivka highway. Separatists have since been trying to regain the lost ground.